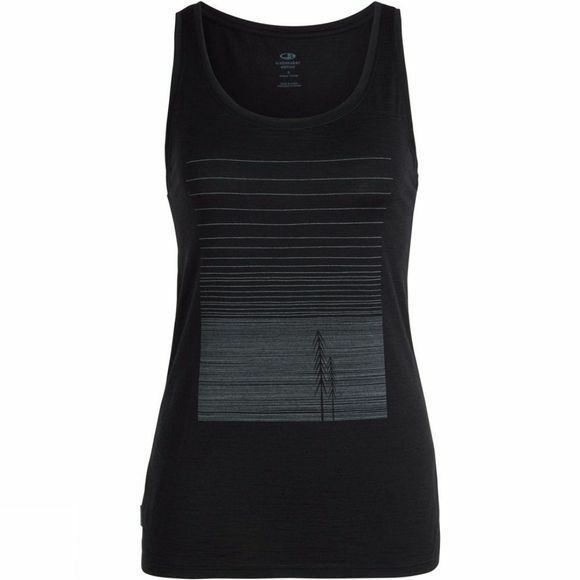 The Women's Tech Lite Tank Woods Top from Icebreaker is the tank top version of the Tech Lite T-Shirt. It is a lightweight, stylish option for your adventures outdoors and in life. It’s made with our beautifully soft 150gm jersey fabric, which comprises corespun fibers of merino wool wrapped around nylon for enhanced durability and a lovely feel next to the skin. Hard to beat for comfort in the heat, it has a scooped neck for a feminine look and fit and forward-set side seams for added comfort. The original screen print by Stu Forsyth adds a contemporary graphic element.